What can writers learn from cavemen? A lot, it turns out. Here are a few ways writers can improve their craft by embracing their inner caveman. You might think we’ve evolved quite a bit since the days when our distant ancestors fretted over coordinating the carpet and the drapes in their caves and still thought fire was a pretty cool gadget. In some ways, we have evolved. Take sanitation, for instance. In other ways, like writing, we can learn a lot from cavemen. Cavemen always kept it simple. Of course, they had little choice. They had no written language, so they had to use pictures to tell their stories. And since Crayola had not yet raised enough start-up capital, they had crude tools that took a long time to manufacture and just as long to use. Keeping it simple, in other words, was as much in the writer’s interest as in the reader’s. Modern computers make it way too easy to drone on and on at very little expense to the writer, but with possible fatal consequences for the unsuspecting reader. Writers need to be able to combine words and images, and to paint images with their words. Images on a cave wall and images in our minds both help us see what is happening. By creating a movie inside our minds, we better understand what the writer is trying to convey. Occasionally, it’s nice and pleasant to describe a lazy midsummer’s afternoon. Especially a nice and pleasant lazy midsummer’s afternoon. However, for the most part, readers want action. Cavemen understood this intrinsically. They could have drawn images of eating or sleeping or picking their noses. They could have drawn pictures of picking berries. No, they drew pictures of hunting, running after animals who for some reason didn’t see the point of being eaten and didn’t like the point of the cavemen’s spears. Speaking of hunting, don’t forget to always include plenty of hunting scenes in whatever you write. Cops hunt criminals, aliens hunt humans and boys hunt girls. It is a critical plot element. Chase scenes really worked for cavemen, many of whose hunting stories have really stood the test of time, despite the lack of blaring sirens and explosive car crashes. Many of their paintings were of stampeding animals, presumably being hunted by cavemen or other animals… although they might just have been stampeding because life in prehistoric times was pretty dull without a little stampeding now and then. Just as a gratuitous car explosion makes a movie more exciting, so, too, does a gratuitous stampede make a pleasant lazy midsummer’s afternoon more exciting. Hollywood seems to have held on tight to its inner caveman, but writers sometimes forget the thrill of the chase and the need for gratuitous stampedes. If your book is about “How to change blades on a circular saw”, you might have a challenge incorporating a hunting or chase scene into your manuscript. Did someone mention “challenge?” Almost every manuscript reaches that point where the writer is so frustrated that he wants to heave the manuscript into a forging furnace and watch it burn, with the manuscript still in his hands. This is a bad, bad, bad idea for two important reasons: first, it would hurt quite a bit (Hadn’t quite thought of that, had you? ), and second, cavemen would not be impressed. Imagine what they had to go through to make their inks and somehow form their images. The pain of writer’s block can’t compare to the challenges they had to overcome just to make ink. Cavemen understood how to tell a story. Let’s learn from them. Don’t show all your cards at once. When cavemen were not drawing in their caves, they were out on the hillside making huge stories that we are still trying to interpret. Were they stories of welcome to alien races stopping over for a quick drink? Were they meant to be the ancestral equivalent of epic novels. We might never learn the truth. And that keeps us reading. Cavemen wrote about hunting. That’s what they did. That’s what they knew. They did not write about penguins. They did not write about Star Wars. They knew nothing of these things, and they wisely chose not to write about them (imagine a cave painting of a dual between penguins and wookies – how would they draw the cool sound effects?). Write about what you know, and You will always know what you are writing about. When you know what you are writing about, you can keep it real. I think archeologists would immediately recognize as a fake any cave painting that depicts a single stick man chasing down a herd of mammoths. Cavemen told such vibrant stories in their time, even without exploding cars and wookie warriors.. And they left those stories secure in their dwellings, where eons later we can learn from them. 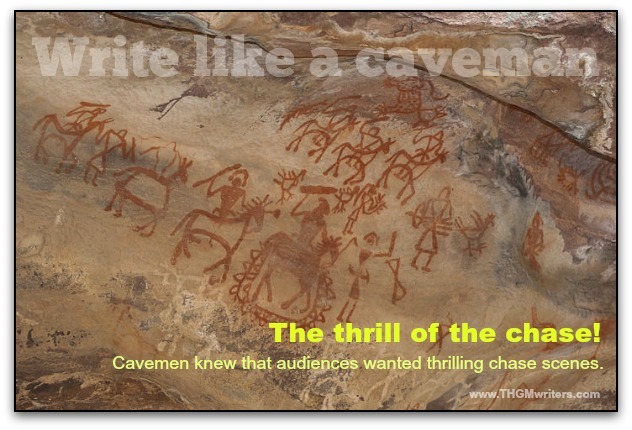 If you want to be a top-notch writer, why not embrace your inner cavemen? Now there was someone who could really write a story. And if a picture is worth a thousand words, some of those stories were epic. Great article and it’s really funny (title). But for the points, I can’t agree more especially with the writing what you really know. I tried writing something I wasn’t ‘expert’ in and it was crazy! Tons of research but certainly doable. If you are planning to do in a long run, definitely not worth it if you ask me. So yes! Nice one man. Actually Reginald, the research you did gave you insight into the topic, and essentially you were writing about what you knew – at least what you knew from what you researched! I once heard that reading a good book on something can make you more of an expert on the topic than most people. On another note, David, I think that making videos like a caveman would work well too. Keeping it simple and using action words are just two of the things that keep me from clicking off a video. Roy, I think you got the “keep it simple” part down pat. What about the chase seen, though?